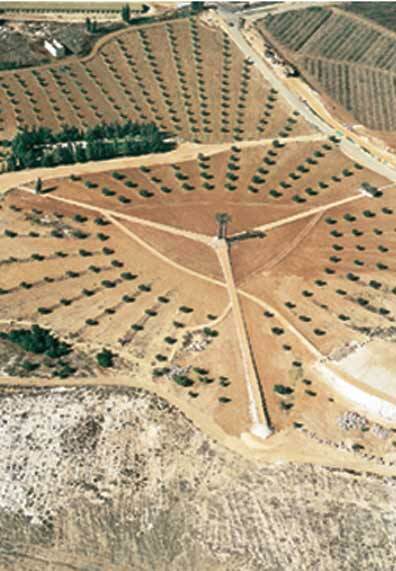 1990 planting of the concentric olive tree garden. 1995 detailed plannong,water & electricity lines..
1996 construction of the paths, viewpoint, parking, transplanting of the olive tree family garden..
Key Meanings :'creative preservation' of an ancient landscape, border zone, former mine fields, Genius Loci, harmonies of the number three, western geometry - natural topography, species of the olive tree from around the world. Artist Statement :The Park of Olives which was planted at the limit of a blood-stained political border, connects different elements in its surroundings and relates to ancient periods in which olive trees and plowed earth were characteristic to man's intervention in this arid landscape..It was constructed with the assistance of modern horticultural techniques and advanced scientific knowledge, nevertheless, its spirit does not reflect victorious control of nature but rather expresses reverence and respect for its infinite beauty and strength.